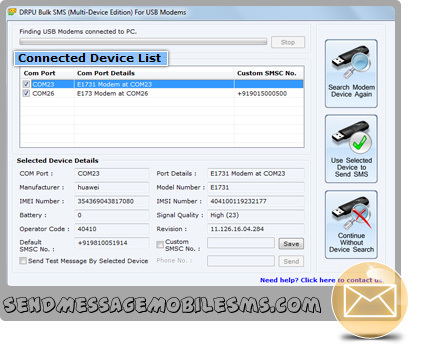 Bulk SMS software (Multi Device Edition) for USB modem successfully delivers thousand of text messages from your PC using USB modem. Text messaging application helps to promote your business products, services or brands and increase business productivity and revenue. → Real Estate Dealers, Advertising and Marketing companies etc. Mass SMS broadcasting software facilitates you to connect numbers of USB modems with your desktop PC or laptop to send thousands of text messages simultaneously. Text messaging program instantly delivers numbers of personalize SMS, greetings, invitation and notification with the help of USB modem connected with PC. Group SMS application for USB modem has advanced inbuilt list wizard facility to maintain list of contacts or groups during bulk SMS sending procedure. Bulk SMS program is useful business apps that provide advanced delay delivery option that maintain load of group SMS broadcasting. SMS gateway software successfully delivers thousands of text messages over worldwide location without requiring internet connection.